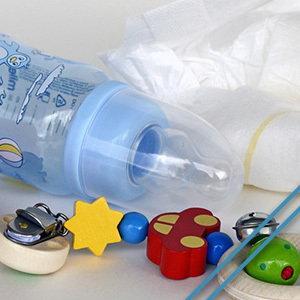 Does your child use a binky (pacifier) or sippy cup on a regular basis? While both objects serve a purpose for your child, they can wreak havoc on their dental health. As a parent or caregiver, you likely spend hours educating yourself on the best care to give your child. From cloth diapers that help the environment to glass bottles to avoid dangerous BPA plastic, but have you considered that sippy cups and binkies can affect your child’s general dental health and set them up for harmful repercussions? In today’s post, we’ll expand on how sippy cups and binkies can attack your child’s dental health! Babies and toddlers can be so cute sucking on their thumbs or binkies as it often soothes a restless or upset child. Whether it’s a thumb, binky, blanket, or sippy cup, these objects can alter the facial bones, including the teeth, and this can become a serious health issue in the future. It has been reported that by the age of four, 60 percent of a child’s facial development will occur, and it’s 90 percent complete by the age of nine. When babies and toddlers use sippy cups and binkies over a long period of time, the devices begin to change the shape of the child’s mouth and the developing bones start to grow around it. Sucking also creates a vacuum in the mouth, that can affect the child’s breathing and swallowing habits that are sustained over a lifetime. Non-nutritive sucking tends to train the tongue to rest on the bottom set of teeth and behind the front teeth. When this occurs the child’s facial development goes askew. As a result, the bones grow back and down creating an undefined jaw and crooked teeth which can affect the air passageway and sleep disturbances may develop. When teeth become crowded, it’s not always related to genetics. It can in fact, be a sign that your child’s facial bones are not developing properly as a result of certain habits or incorrect tongue placement. The correct placement for the tongue is snuggled on the roof of your mouth about a half inch from your upper teeth. When the tongue placement is on the bottom, it shrinks the jaw which makes it difficult for teeth to come in properly. The overall takeaway from sippy cups and binkies is they lead to an insufficient jaw size, bone density issues, and weakened neck and face muscles. The best solution is to limit the use of non-nutritive sucking items because when they become a daily need or habit, this is when dental problems begin to occur. If your child does use a binky or sippy cup on a regular basis, there are things you can to to help break the habit. You can use the pacifier only in emergency situations such as if your child is in pain or in an anxious situation. You can also positively reward your child when they choose to go binky-free with stickers or extra play time. In the end, as long as you’re steering clear of punishment or negative reinforcement, your child should be able to break the habit over time and with encouragement and comfort from you! Today we’ve explored all about the damage non-nutritive sucking can cause on your child’s dental health and how to help break the habit. For more information on family dentistry to help treat and prevent binky and sippy cup habits, contact Precision Dental of Windsor today!